Spirit bearer: bear spirit with an anthropomorphic face. Nivkh people, Amur river basin, Federation of Russia. Museum fur Volkerkunde, Dresden. Wikimedia Commons. 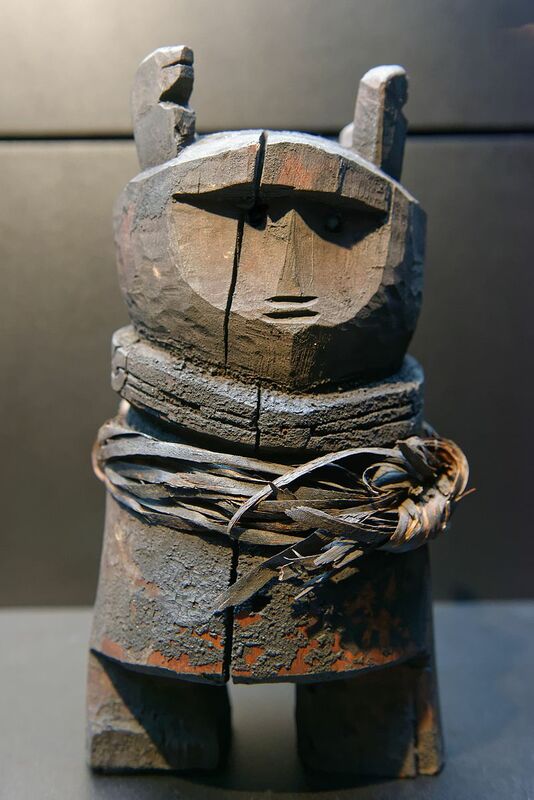 Germany will invest as much as $2.17 million in a project to investigate how ethnographic and ancient objects from around the world that are now in German museums were acquired. The funds will be available to museums for provenance research, especially for investigating objects collected during the nineteenth and early twentieth century colonial period. A number of Native American communities have had difficulty working with German institutions in the past. While the new program will focus primarily on investigation of ‘colonial’ objects, it may offer U.S. tribes opportunities for documenting both Native American human remains and important cultural objects and for eventually seeking their return. 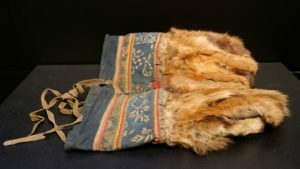 Woman’s mittens made from red fox fur, indigo-dyed cotton canvas and leather. Orok people, Sakhalin island, Federation of Russia. Museum fur Volkerkunde, Dresden. Wikimedia Commons. The funding program will be administered by the German Lost Art Foundation. Prior to this new program, the Foundation was tasked with investigating the provenance of cul­tur­al as­sets con­fis­cat­ed by the Na­tion­al So­cial­ists through per­se­cu­tion, par­tic­u­lar­ly from Jew­ish own­ers, and the loss of cul­tur­al as­sets during the period of Soviet occupation and the German Democratic Republic (GDR). In 2018, the Foundation received funding of 5.95 million EUR from the German federal government along with additional funding from Saxony-Anhalt. 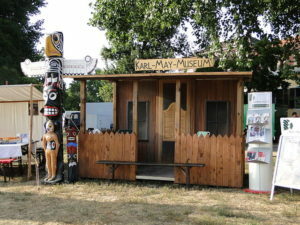 Karl May Museum Radebeul, Werbung auf dem Dresdner Stadtfest 2012, photo by Paulae, Wikimedia Commons. The first grant deadline for project proposals is June 1, 2019. 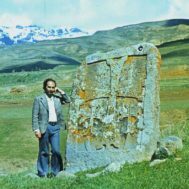 The foundation has published a Guideline for the Funding of Provenance Research Projects on Collections from Colonial Contexts, 2019/01/01. 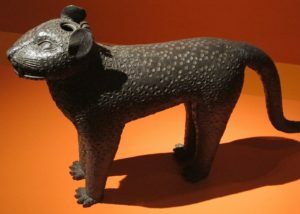 Benin bronze leopard, eighteenth century, Leipzig Museum of Ethnography, Photo by Salika. Wikimedia Commons. The $2.17 million for the new program will be administered by the Foundation with the guidance of an eight member advisory board that will include Bénédicte Savoy, one of the co-authors of the report, The Restitution of African Cultural Heritage. Toward a New Relational Ethics, which was delivered to President Macron of France last year. 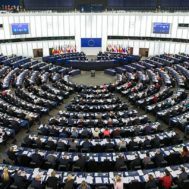 Other members of the advisory board are Prof. Wiebke Ahrndt (Übersee-Mu­se­um Bre­men), Prof. An­toinette Do­minicé (Lud­wig-Max­i­m­il­ians-Uni­ver­sität München), Prof. Al­bert Gouaf­fo (Uni­ver­sité de Dschang, Cameroon), Prof. Mon­i­ca June­ja (Uni­ver­si­ty of Hei­del­berg), Prof. Ul­rike Lind­ner (Uni­ver­si­ty of Cologne), Dr. Bar­bara Planken­stein­er (Mu­se­um am Rothen­baum, Ham­burg), Prof. Béné­dicte Savoy (Tech­nis­che Uni­ver­sität Berlin), Ma­ja Schweitzer (BKM, Berlin) and Dr. Stephanie Tasch (Cul­tur­al Foun­da­tion of the Ger­man Fed­er­al States, Berlin). 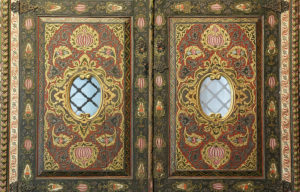 The Damascus room. Detail of painted and carved wood. 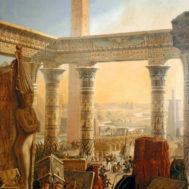 The art collector Karl Ernst Osthaus (1874–1921) purchased the room in Damascus in 1899, Museum für Völkerkunde Dresden. The Museum Five Continents (Museum Fünf Kontinente) in Munich, Germany, holds 200,000 objects. The Dresden Museum of Ethnology (Museum für Völkerkunde Dresden) holds more than 90,000 objects. The Leipzig Museum of Ethnography (Museum für Völkerkunde zu Leipzig) holds 200,000 objects. The Museum of World Cultures (Museum der Weltkulturen) in Frankfurt, Germany holds 65,000 objects. The Sammlung für Völkerkunde (Ethnological Collection) at the Institute of Cultural and Social Anthropology of the University of Göttingen, has 17,000 objects.